Almost all religions hold as fundamental the need to spread the word of their beliefs. Many also put an emphasis on the importance of converting others to their way of thinking. You're likely to have seen at some point in your life a person who holds a particular belief expressing what they believe. Be it in a church, a mosque, on a bill board, or whilst walking down Market Street, we've all been witness to religious messages and preaching. In a sense, this could be thought of as a form of marketing by religions. So how have they harnessed a new broadcasting platform; that of social media? With social media having such a large user-base it makes perfect sense that religions should promote their beliefs online. Christians believe that Jesus said: "Go into the entire world and preach the Good News to everyone". Twitter actually enables this. Social media proves an exciting prospect for all religious voices, giving the ability to speak to a large audience of both believers and non-believers alike, in an instant. It could also be advantageous to 'armchair believers' – e.g. Christians who hold some kind of belief but would be too nervous or busy to attend a church service. There have been many examples of religions using social media tools to increase awareness of their beliefs and to enthuse current believers. Social media platforms have also proved popular with preachers as it is a cost-free opportunity to explain their convictions. Religions have used Twitter to broadcast prayers and uplifting messages with many churches and religious leaders having accounts. 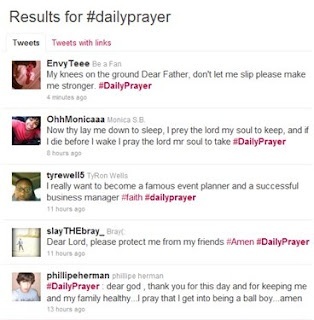 #DailyPrayers is also a regular trend - people can use the hashtag to post their prayers and follow it to see prayers posted by believers. The Rev Richard Jones of Burscough has even used the tool during services, encouraging people to tweet their thoughts in the middle of his sermons. 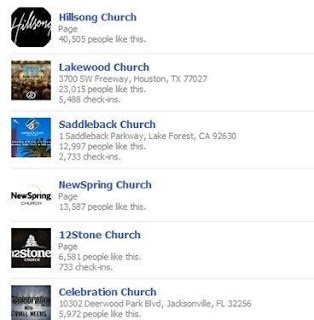 Facebook is very prominent among believers, with many churches having pages with large amounts of 'likes' and the ability for members to 'check in' online. Allfacebook.com, the 'unofficial Facebook resource', regularly looks at Facebook statistics.In the weeks before Easter 2011 it found that The Bible's Facebook page was seen to have the highest level of engagement, based on their metrics, even surpassing Justin Bieber and Manchester United. Many churches, particularly evangelical churches in the US, have YouTube channels for broadcasting regular services. There is also a Muslim YouTube Channel, Hinduism Today Channel and various channels for synagogues. Although there are examples of social media platforms being used negatively to submit extremist messages, there are many examples of them being used well. There are a great many instances of religions and cultures using YouTube, Twitter and Facebook simply to explain their ways of thinking and educate people about their beliefs. This ability for wider communities to explore religions online enables them to learn more, promoting understanding and acceptance and hopefully leading to less hostility towards and between religious communities.